The hammer fist (or hammer strike) is wildly popular with beginning Krav Maga training. Its versatility and ease of deployment make it a favorite among new self defense enthusiasts. But then, why don't we see it in the octagon, or other professional fighting environments? Other than on the painful end of a ground-n-pound, the hammer fist is largely absent from the ring. If it's not good enough for a professional fighter...why would I want to add it to my personal self defense arsenal? The professional sport fighter is going to see the hammer fist from a very different perspective from us. In the ring, the hammer fist will rarely present the "best" option. The most common professional sport combatives (i.e. jab, cross, hook, and uppercut) all present alternatives to the hammer fist that excel in either range, speed, and/or power. For instance, you can throw a jab from a greater distance than you can throw a hammer fist. Or, if you are inside, you can generate more power from a hook or elbow. There are simply better tools to deploy in various given situations, than the hammer fist. If the hammer fist is not the longest ranged, the fastest, or the strongest strike...why do we see it used in such abundance in Krav Maga, a self-defense and fighting system that prides itself in effectiveness and efficiency? The hammer fist may not be 'best in class' of anything, but it still has some critical benefits working in its favor. 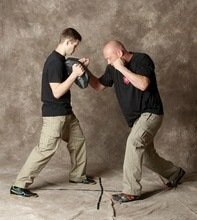 However, before diving headfirst into the benefits of the hammer fist, let's take a step back and establish some good, solid Krav Maga Technique. The Hammer Fist is a short-ranged combative technique that involves a very natural, primate movement. The fist is brought down and out, like a hammer. Contact is made with the fleshy part of the bottom of the fist. Your feet, hips, core, and shoulders drive the strike, with your body weight pulling the strike through and back. You’ll most likely deliver this either on the vertical or horizontal plane, but you can also strike at various angles. It's fast. It's powerful. And while it all happens in a blur, there are 3 distinct steps that need to happen for effective delivery of the hammer fist. First, remember, the hammer fist connects with the fleshy part of the bottom of your fist. The chances of you breaking a bone or hurting your hand are dramatically reduced when using a hammer fist. There are 27 bones in each of your hands, many of them very small and easily broken. It's the same philosophy that has self-defense practitioners throwing palm-heel strikes instead of straight punches; less random things to go wrong. Second, the hammer fist is based on a gross motor skill. It is very animalistic, almost 'ape-ish' in nature. Straight punches, like the jab and cross, are all learned Krav Maga techniques. If we could ask a random person with no martial arts training to throw their best punch at a target, chances are, it'll be some variation of a "haymaker"; a wild, sloppy, swinging type of punch. A jab or cross, both straight punches, are NOT natural. Any time you see someone throw a jab or well crafted cross, you can almost guarantee, that person took the time to learn, practice, and become familiar with that particular combative. Even with great instruction and diligent practice, it can take months to learn how to properly throw a good, solid, straight punch. The hammer fist is very different. A new recruit can utilize the hammer fist from ‘day one’, and begin building strength and confidence in striking with the hands. Not only is the hammer fist easy to teach and learn...perhaps most importantly, it is easy to REMEMBER. When our fight/flight/freeze response gets triggered, and our body suddenly drops this massive adrenaline dump, we don't think or recall as we would in a normal situation of non-duress. But the hammer fist, because it is so natural, so primal, you'll have a better chance of recalling it...and using it. And third, the hammer fist is a great gap filler. What does that mean? As you become more proficient in building out your arsenal of combatives, your hammer fist may begin to see a lot less time on the mat. However, there will always be a place for it, especially in the area of gap filling. The hammer fist works great in transitioning between short and medium range. Going from a medium punching range to a short elbowing range, or doing the opposite by pulling out of short range into medium, you can insert one or two hammer fists to make that transition more seamless. The hammer fist can also be used to gap fill a directional change. Take for instance a threat that comes in, unexpectedly from the side or even behind. You can strike quickly with a hammer fist and then turn into the opponent. We like to call that "earn the turn" and leading with your weapon. So...the hammer fist, a viable self defense combative? Absolutely. For the above listed benefits, the hammer fist will always be a staple in the self-defense world. It would be nice to be able to deploy the longest ranged, strongest, and/or fastest strikes. It would be nice to be able to regularly practice and condition our bodies' muscle memory to use these more effective strikes. It might also be cool to catch an intruder with that spinning tornado kick to the head! But you might not have the luxury of training as long or as frequent as you’d like. You might not have the peace of mind (during an assault!) to remember all your cool fighting tricks. In those situations, you’ll want that tool that you’ll always remember, that tool that always works...the hammer fist.